Santa Cecilia Granite is also recognized as St Cecilia Classic Granite, Santa Cecilia Granite, St Cecilia Granite and Giallo Cecillia Granite. Santa Cecilia granite has many beautiful variations that can be used both indoors and outdoors; as a backsplash, as floor tiles in the bathroom, and kitchen countertops. It tends to have a creamy base with hues ranging from dark colors such as brown to lighter hues of gold. Even the black speckles can range from black to wine-red. These speckles and veins against the base create a pretty contrast. When ordering this stone, it’s best to be present physically and make sure that all the tiles come from the same slab because they do differ, even within the same color category. Not only is it pretty, but it’s functional. Because it’s granite, it can withstand high temperatures and it’s harder than marble and quartz. If you are looking for kitchen renovation ideas and inspiration, we invite you to visit Mastering Kitchens and design. This stone has a yellowish tone and you’ll recognize it because of its burgundy, brown and black flecks. It’s a rich earthy color and brings a bright yet calming earthy feeling to a room. It works really well with lighter colored kitchen cabinets. The base of this slab is a blend of cream and yellow which contrast beautifully with the black spots and veining. Such slabs complement darker kitchen cabinets, bringing aesthetic balance to the kitchen. Saint Cecilia Gold Granite consists of a combination of beige, brown, gold and black. The bedrock ranges from a light yellow to a darker hue. It has a very earthy feel and one of its appeal lies in its golden color range. These golden tones become bolder as this stone is exposed to more light so it’s a beautiful piece to have in the kitchen or outside where it’s exposed to sunlight. As long as you apply a sealant, granite is one of the most durable types of stones used in homes. The only stone stronger than granite is diamond which makes it suitable for homes with children. They can bang away and your countertop will remain intact. This gives it an edge over marble which can crack or chip if you’re not careful with it. You can place your piping hot souffle straight out of the oven onto the granite countertop without using a trivet. One of the disadvantages of other stones is that they stain when very hot items are placed on them. But the kitchen is a place where you want to be able to cook with reckless abandon and not have to worry about staining countertops. Considering all its properties, granite countertops are fairly priced compared to marble countertops. Santa Cecilia slabs average at around $45 for a 3 cm thick slab per square foot while marble averages at $60 per square foot. Santa Cecilia comes in a wide range of colors despite it being a natural stone. That’s why it’s recommended that when shopping for a color, it’s best to go and view the slabs yourself because for the same name you will find a variation between slabs. With Santa Cecilia’s range of stones you’ll find something that suits various decors and themes. The lighter colored stones can be used in commercial kitchens. Warm tones can be used in homes. They can go with a modern, vintage and many other themes. No two slabs are alike. You can buy Santa Cecilia granite or other slabs knowing that even if you bought the same type of Santa Cecilia Granite as someone else, they are not the same. If you’re too lazy to pull out a cutting board, go ahead and slice and dice on the granite. It won’t leave any scratches. Just make sure you’ve cleaned the surface first. Santa Cecilia Granite is quite porous so make sure that you apply a sealant when you buy it and continue to do so every few years. Besides that, all you need is soapy water and a rag to clean it. You can use a sponge to clean stubborn stains and then wipe the area clean with a dry rag. Sometimes food and grime when not cleaned properly will collect where the tiles meet especially if you were rolling dough on the countertop. Be keen when cleaning this area so that you maintain hygiene. If you’re not keen, you could end up buying fake granite countertops and realizing that you were conned when it’s a little too late. You might also be house hunting and want to be able to tell whether the countertops in the houses that you’re looking at are really granite. If it’s a wooden countertop covered in laminate, you’ll be able to see the laminate and wood at the edge. Granite countertops are also thicker than wooden and marble countertops because of their strength. Use a metal object such as keys or a hammer and gently tap the surface. Granite will have a ring to it, a bit less than marble but artificial stone won’t have a ring. If it’s too cheap then it’s probably too good to be true. You can get granite at a steal for less than $30 per slab but it’s probably low quality granite or it’s fake. Quality granite starts at around $45 and can go as high as $200. Are the colors and patterns uniform? Granite is a natural stone and the colors, veins, speckles won’t be uniform. Artificial stone on the other hand will have a more uniform and repetitive pattern and color. This only works if the granite hasn’t been sealed. Granite is porous so if you pour water on it, it should soak it in and darken unlike quartz which is waterproof. 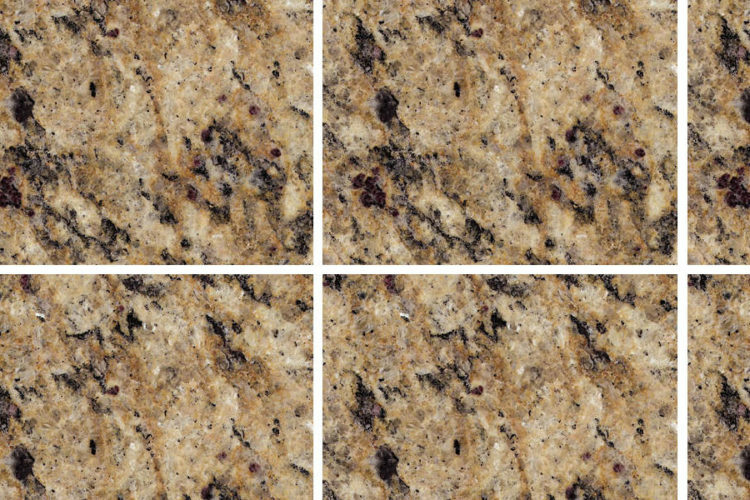 If you look closer at granite, you’ll notice that it has very fine crystals of varying colors. 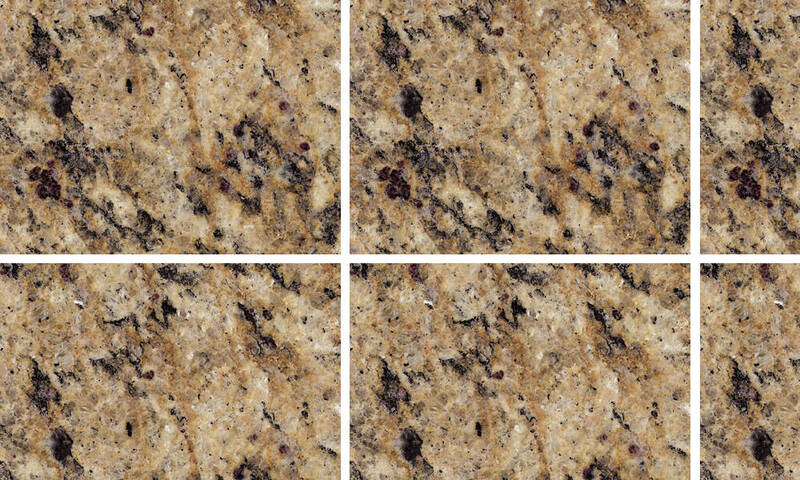 Granite is also composed of multiple colors. There’s usually the main backdrop color complemented by various other colors, perhaps 3 to four such as the color of the veins, the color of the flecks and the different colors of the crystals. Marble tends to have fewer colors. Granite is a popular stone with good reason. It will probably outlast you and it’s the stone that just keeps giving. It’s versatile in the number of interior decor themes that it can work with, it’s elegant, and if you have kids, you don’t have to cringe in fear every time they take a crack at it. It’s hard to go wrong with Santa Cecilia Granite as your choice of granite. It’s a beautiful stone and it comes in a range of gorgeous colors including golden hues. It requires minimal maintenance and as long as you get a good sealant, it will give your kitchen or other areas of your home a warm and contented feel.